There have been numerous media reports on an outbreak of “canine influenza” that began in Chicago, and could spread to other areas. The original dog flu virus that was characterized a few years ago is known as H3N8, and there is a vaccine for that virus. However, this virus is different: H3N2. The currently available canine flu vaccine does not protect against this virus. Symptoms of the H3N2 flu are primarily sneezing and coughing. It is highly contagious; but while unpleasant, it is far less dangerous than the H3N8 virus. The most likely places for your dog to contract this flu virus are doggie daycare and boarding kennels, dog parks, grooming facilities, pet stores, and veterinary clinics–all places where a lot of animals pass through, and the chances of spreading the virus are high. The best defense against this virus is to support your dog’s immune system with top quality nutrition, stress management, and adequate exercise. For more information, see: Little Big Cat’s article on Immune System Health, which applies just as much to dogs as to cats; and, of course, Paleo Dog! A recent study in Hungary discovered that dogs’ brains react to human voices as well as emotional sounds like laughing or crying. 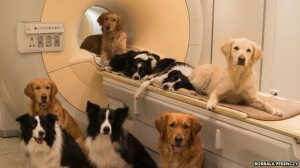 Eleven dogs were trained to stay perfectly still in an MRI machine d uring scans, while a variety of sounds were played for them. Twenty-two human volunteers performed the same task. Perhaps even more interesting is the discovery that emotionally charged dog sounds – such as whimpering or angry barking – caused a similar reaction in both humans and canines (although dogs had a bigger response). Humans’ and dogs’ evolutionary paths have been closely intertwined for thousands of years, so it’s not surprising to us that we’ve developed similar responses to each other. We’re truly BFFs! Is your dog a couch potato? Do you carry your dog around in your bag or arms? Are your dog’s walks confined to concrete and asphalt? Click here to find out why it is so important to give your dog plenty of paws-on-dirt-and-grass time! A couple of years ago, your authors were introduced to a non-fish form of Omega-3, an oil from New Zealand green-lipped mussels (GLM) called MOXXOR. We’ve taken a hard look at the data (pro and con), and are very impressed. 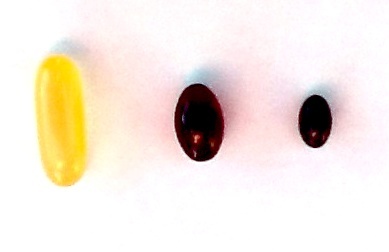 The teeny tiny capsules are very easy to give by mouth. Of course, the capsules can also be punctured and and the oil added to food; the taste is definitely ocean, but it’s not strongly fishy. New Zealand greenlip mussels (Perna canaliculus) are grown under a Sustainable Farming Program that ensures the long term viability of the greenlip mussel industry, with minimum impact on the environment. GLM are bi-valve mollusks known to be a rich source of 33 fatty acids, of which 18 are Omega-3s (including EPA and DHA). One of GLM’s unique array of Omega-3s is ETA (eicosatetraenoic acid). ETA, which is not found in any other foods to any measurable degree, has extremely powerful ant-inflammatory properties. MOXXOR is the premier producer of New Zealand greenlip mussel oil: it is organic; sustainably grown; cold-extracted; and certified free of mercury and other toxins and pollutants. In order to ensure freshness, the mussels grown for MOXXOR are processed in a facility built on the shores of the Marlborough sound where they are grown and harvested (try visiting it on Google Earth, it’s amazing!). Because the southern hemisphere’s oceanic circulation is essentially isolated from the north, radiation from the Fukushima nuclear reactor cannot reach it. Click here for the shopping page or, if the link isn’t working, visit www.mymoxxor.com/holisticvet. To sign up as a Preferred Customer (and get a big discount) and/or autoship, be sure to click the JOIN link in the upper right corner. Don’t worry, this does not obligate you to become a distributor (unless of course you want to!). You can cancel any autoship at any time, but you definitely want to get the Preferred Customer discount. A gentle source of gastrointestinal support for dogs that includes probiotics, prebiotics, fibers, and herbs. One 8-oz. jar (approximately 60 doses for dogs up to 20 lbs.) contains a proprietary blend of the following non-dairy probiotic strains, prebiotics, fibers and herbs: L. Acidophilus, L. Rhamnsous, B. Bifidum, B. Longum, L. Salivarius and L. Plantarum plus freshly ground Organic Flax Seed powder, Chicory root (inulin), Pectin, Konjac root (Glucomannan), Beet root, and Slippery Elm. BEMER technology is a biophysical application to optimize the body’s own natural vitality and wellbeing utilizing “Information Medicine.” By means of sending a unique signal to the body (our animals as well), BEMER stimulates the rhythmic pumping action (vasomotion) of our bodies’ tiniest blood vessels – the microcirculation. Distribution of the very essences of life is improved with its use. The benefits of BEMER technology is the support of the body’s own healing and maintaining abilities; they reach the entire body and can be experienced by everyone with no known negative side-effects. The signal itself is carried on pulsed electromagnetic fields, which was chosen by BEMER becauswe Pulsed Electro Magnetic Fields (PEMF’s) are safe, and because it is technologically and economically feasible. The use of PEMF however, is merely incidental to that purpose and not causal to the biological effects observed. It is just the carrier medium. BEMER could as well use light waves or mechanical waves like ultrasound, etc. Because of this BEMER is not to be considered a PEMF device per se. It is in fact very different from the many PEMF devices that are advertised on the market which do not have much in common with the BEMER technology at all. BEMER is compatible with and complementary and alternative therapies as well as to conventional medical treatments and procedures. A fast growing number of hospitals, medical professionals (veterinarians, physicians and practitioners) as well as athletes and individual BEMER enthusiasts of all demographics in over 40 countries around the world are successfully using clinically proven and FDA registered BEMER devices to improve the quality of their lives as well as their companion animals. The BEMER Signal is the result of 15 years of ongoing scientific research (clinical trials, double-blind, placebo controlled studies in addition to the FDA study which is currently being conducted) in collaboration with independent research facilities such as medical faculties of diverse universities, independent institutes, health professionals and BEMER Group’s own research resources. Hundreds of thousands of BEMER applications all over the world and empirical observations by means of real-time images, using combined hi-tech intravital microscopy and laser-doppler flowometry, have ultimately led to the patented BEMER signal configuration. Since 2012, NASA is contemplating the possibility of integrating BEMER technology into their own developments as the BEMER signal is recognized as the most researched, most advanced and most effective signal for the enhancement of microcirculation and other physiological regulatory processes. In metaphoric words, it is precisely this unique signal configuration that constitutes a newly deciphered letter in the alphabet of a universal signal “language” that is understood by the body to trigger physiological processes. With these discoveries, BEMER is at the forefront in the new field of “Information Medicine”. How does BEMER Technology compare to PEMF, and what makes it work? We often hear or read about all kinds of “PEMF” devices who base their claims on the effect which pulsed electromagnetic fields have on our bodies. It is often mentioned that biological effects are caused by certain energy outputs and frequencies which are to be high or low or user adjustable, etc. However, what is really important (and yet often neglected) is actually the presence of a very specific signal configuration in which the waveform plays an extremely important role as well. This specific signal configuration is what constitutes the “information” which is transferred to the body and which appears to cause the observed effects. In other words: It’s not the pulsed electromagnetic field per se, but the “information” carried by the field. Think of radio-waves which modulate our voices and carry spoken word. If the station is on air but nobody speaks, there is no information. So, the field is only the carrier medium. Indeed, just like PEMF can be used, other media could be used as well, for example light waves. In fact, BEMER research recognized this fact and developed light applicators which produced the same remarkable effect as its PEMF modules. Let’s imagine the BEMER signal as a popular song, as a beautifully composed sequence of musical notes (signal configuration) and its accompanying lyrics (information). Playing these notes in the right order, with the correct rhythm and with the right volume, we are able to recognize a well-known melody. Interestingly enough, it does not seem to matter what instrument we play the melody on. Whether played on a piano or a saxophone (carrier medium), we always recognize the song. The melody catches our attention and makes us receptive for the lyrics contained. And given these exact lyrics, that song becomes meaningful to us as it tells a story or is associated with memories, hence able to trigger emotions or other reactions. The song is the signal, and we react to it. So, if you will, the BEMER signal is just that; a song to our bodies. Should users be able to adjust the signal? Let’s look at the analogy again: If we changed the notes, changed the sequence, the tones, the rhythm, etc. of a complex composition, we would most likely change the melody beyond recognition. No one would recognize the song anymore. The uniquely characteristic melody is lost and with it, the song itself, the memories, the associations. Unless we were skilled and talented composers and musicians, by changing the notes and rhythm we would most likely end up creating a dis-harmonic noise. Additionally, with the lyrics changed to a language we don’t understand, this noise would now have become completely meaningless to us. Chances are we don’t react to this type of “signal” anymore. It is as good as honking a horn. This is precisely where BEMER’s research of signal configurations over the past 15 years has led to remarkable discoveries and developments of very peculiar and unique signal configurations which must not be altered. It it is important to preserve the signal configuration unaltered. Today, the BEMER signal is a well composed “song” carrying precise information which is recognized by our bodies, stimulating vasomotion and thus improving our microcirculation. How do we use the BEMER device? The new BEMER device generation comes in either the Classic or the Professional model. They both offer the same benefits and can both be enjoyed by people and our companion animals. The difference is simply that the Professional model comes with all the attachments and is some other features that make it the more cutting edge device. Using the BEMER device is as easy as lying on the BEMER B.BODY mat and pushing the start button to the particular mode and program you wish to use for yourself or your animal. And then enjoying an 8 minute (or longer) session (with or without spot applicators) which improves microcirculation by up to 30%. Click here for a video presentation explaining BEMER tecnhology. For more information, visit Art of Wellness or contact Celeste Yarnall at (818) 707-6331 or email celeste-AT-MoxxArt-DOT-com. Salba® (ground black and white chia seeds) is the richest whole food source of alpha-linolenic acid (an essential Omega 3 fatty acid) and fiber found in nature. Gram for gram, Salba provides eight times more Omega 3s than salmon, four times more fiber than flax, six times more calcium than whole milk, 13 times more antioxidants than blueberries, and much more. Salba is all-natural, has no trans-fats, very few carbohydrates, and is certified Non-GMO, Vegan, Kosher, and Gluten-Free for those who suffer from celiac disease. Salba mixes well with smoothies, yogurt, dips, and can be mixed with flour for baking. The authors of Paleo Dog have also taken on the feline species in their book, The Complete Guide to Holistic Cat Care (Quarry Books 2009), won a 2010 Certificate of Excellence as well as the prestigious 2010 Muse Medallion Award from the Cat Writers’ Association. Click here to read full reviews on Amazon.com. To order the eReader/Kindle version from Amazon.com, click here. To order the paperback from Amazon.com, please click here. To purchase an autographed copy, contact author Celeste Yarnall at CelestialPets.com. What makes BSF (and the pet formulation BioPreparation or BP), different from other popular algae products, like spirulina or chlorella? It contains a synergistic combination of four unique species of blue-green algae. These species have polysaccharide cell walls, rather than the indigestible cellulose cell walls of most other species such as spirulina. BSF and BP are therefore easily digested and absorbed. Their extreme bioavailability makes them particularly valuable for animals with digestive problems. BSF and BP are also quite palatable, and even fussy pets will eat without complaint when either is mixed with their wet food. NOTE: If your pet eats dry food, please read this article right now; and come back to this article afterward! Your pet’s life depends on it! We are proud to recommend BSFand BP to our furry (and non-furry) friends. There are several formulas, so we want to make sure your pet is getting the formula best suited to his or her circumstances, at the correct dosage. Click here to get started. Please note: We do not sell BioSuperfood or BioPreparation! If you have further questions, or if you would like to order any of these products, please contact www.optimumchoices.com.